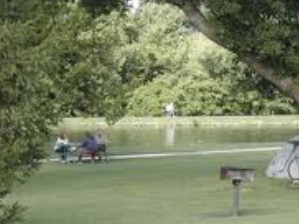 Many fishing and camping areas are located near Tecumseh and Johnson County. The Nemaha Natural Resources District lists several lakes but the closest is Wirth Brothers Lake. Wirth Brothers Lake (pictured above) opened in 1996 as part of South Branch Watershed flood control project. Its facilities include tent camping, boat ramp, handicapped accessible dock, fishing access, drinking water, nature trails, picnic shelters & tables, charcoal grills & fire rings, primitive restrooms, playground, sand beach & swimming area and sand volleyball court. New at Wirth Brothers Lake is an archery range located behind the dam. The range is open to the public and includes several handicapped accessible targets. Nemaha NRD park permit required. Burchard Lake State Park (Pictured right) is a 150-acre lake created in 1958. It features year-round fishing, camping, hiking and picnic areas. Come with binoculars and go out very early to use the blinds that have been constructed in the park for bird watchers to enjoy viewing the prairie chickens booming in February, March, and April, as well as other wildlife. According to the Nebraska Game & Parks website, there are three Wildlife Management Areas located around Tecumseh and in Johnson County. Access to these lands is free, and no entry permit is necessary. However, to protect these areas and their many assets, there are certain rules that all must abide by. Click here for WMA rules. Osage Wildlife Management Area is located 3N, 2W, ¾N of Tecumseh. It offers 778 acres of hunting area. There are four one acre ponds located within the WMA for public fishing. Twin Oaks WMA is located 2 E and 3 S of Tecumseh and encompasses 1120 acres available for hunting. There are also two one acre ponds located in the WMA available for public fishing. Hickory Ridge WMA is ½W, 3½S of Vesta and contains 564 acres of hunting area. Click here to purchase a State hunting permit. Nebraska Game & Parks Permit Required.